The following songs show the blues evolving, becoming smoother and tighter – more like the blues modern listeners are used to. This is still strictly acoustic material, but the roots of modern electric blues are firmly in place. 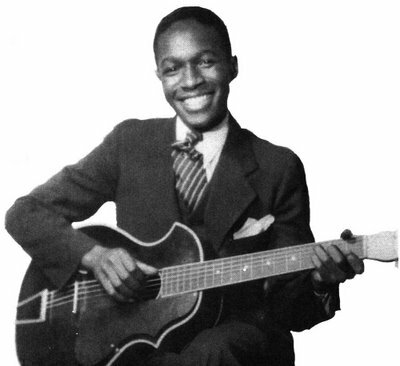 Josh White was a versatile performer who was equally at home playing blues, folk and gospel music. Because of this versatility and because he spent the latter part of his career as a folk revival singer, he sometimes gets overlooked as a blues musician. That is a shame, as his blues musicianship was the equal of any of his contemporaries. “Jesus Gonna Make Up My Dyin’ Bed” is a gospel blues classic (and, incidentally, the original inspiration behind Led Zeppelin’s “In My Time of Dying”). The record is almost too easy to listen to: White’s pleasant voice and smooth, effortless slide guitar are almost soothing, and the lyrics are simple and straightforward. But listen to it again! Yes, that slide guitar is polished, but it is also as passionate as any Delta bluesman. White’s playing may be wine instead of whiskey, but it is no less intoxicating. His technique during the bridge is particularly impressive, as he snaps out a series of compelling, deep notes. The same can be said of his singing voice: easygoing, yes, but also expressive. Listen as he sings: “In the time of dying, I don’t want nobody to moan / All I want my friends to do: come and fold my dying arms.” The subject matter is bittersweet, and his tone mirrors it: simultaneously buoyant and reflective. It is an amazing performance, and it’s no wonder that it was able to inspire artists like Led Zeppelin so many years later. 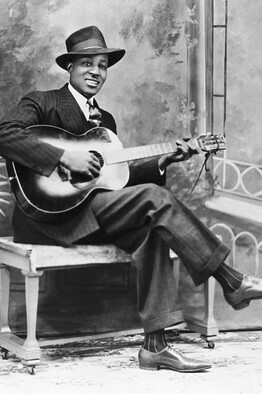 While growing up in the Mississippi Delta region, Big Bill Broonzy’s first instrument was the fiddle, but he switched to guitar when he moved to Chicago in 1920. He struggled to find success as a recording artist until 1934 when he signed with Bluebird Records and his many years of effort finally paid off. The records he made with Bluebird would help define a new style of urban blues that would set the tone for all blues to come, and Broonzy himself would go on to have a long, well-respected career.